I found my oldest son in my office looking through my cookbooks yesterday. When I walked in the room he said he wanted these, pointing to a picture of Banana Doughnuts. Since I can’t seem to say no to a food request and because I happened to have two ripe bananas on the counter, I baked these up just before he came home from school. He loved them. A tall glass of cold milk and two doughnuts later, he gave me the thumbs up. These are easy to make and taste like a very moist banana bread. You can easily leave the nuts out if you like. I even put a glaze on them at the end. 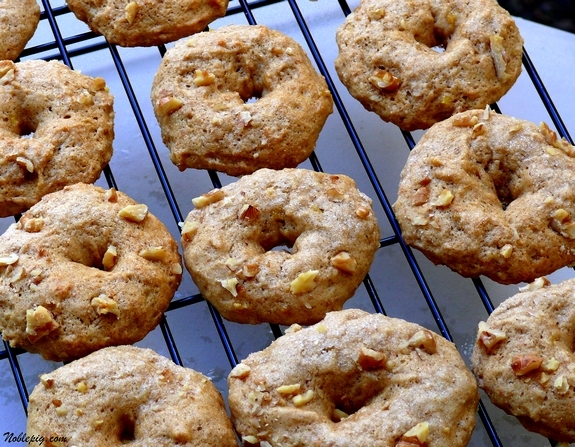 You could also use 8 ounces solid pack pumpkin instead of bananas to make pumpkin doughnuts. We will be making these again. Beat bananas, egg whites, oil and brown sugar in a large bowl. Add flours, baking powder, baking soda and pumpkin pie spice. Mix until well blended. Let stand for five minutes for dough to rise. Scoop out heaping tablespoonfuls of dough onto a greased baking sheet. With the tip of a butter knife round out the doughnut holes in the center of the dough. Then use the butter knife to smooth outside edges of dough into round doughnut shape. Repeat until all dough is used. Sprinkle with granulated sugar and walnuts. Bake 6 to 10 minutes (mine took 8) in a 425 degree oven or until tops are golden. Remove from pan and place on a wire rack to cool. I decided to drizzle some icing on them as well. It was the perfect addition. I used a 1/3 cup powdered sugar and 2 Tablespoons of milk. 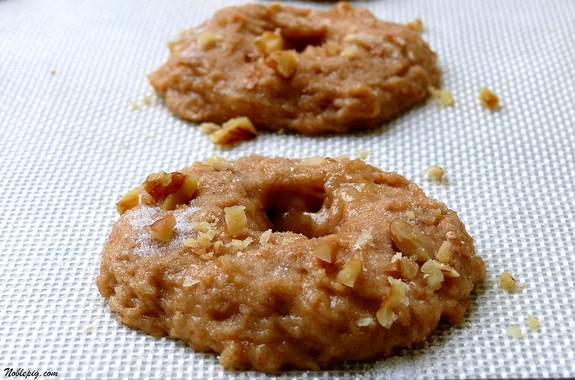 Variation: You could also use 8 ounces solid pack pumpkin instead of bananas to make pumpkin doughnuts. Yum! These look amazing! Your son is very very very smart. thank him for me. Holey Donuts, Batman! These are terrific. I love how the shape was created using a butter knife (genius!) and the sprinkling of sugar and nuts is super-d-duper in my book. This will be so fun to do during the holidays. Bookmarked! I just might even make these tomorrow! They’re low fat, too, and would be a great school snack as they always want “healthier” treats. I’m a sucker for all things banana. 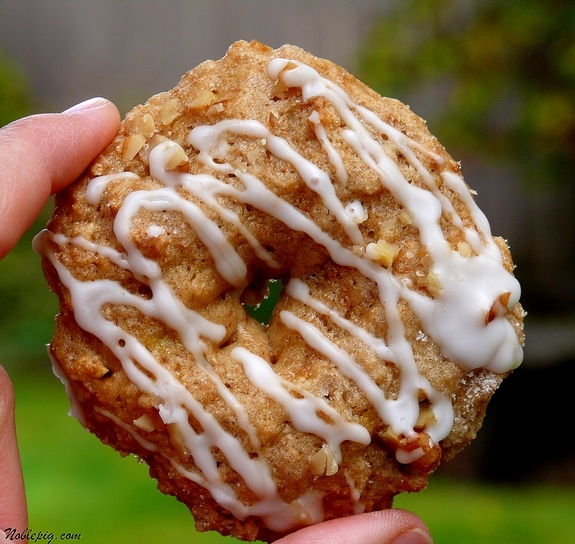 Great idea making this recipe into a baked donut. I love it! The recipe sounds really yummy n looks amazing too !! I have a food art blog. I think these sound like just the ticket for grandkid’s breakfast at Grandmas’! I forgot to mention how interesting I thought it was for your son to be perusing cookbooks. It will be exciting to see what interests the hoodlums pursue as they grow up. This is so much easier and healthier than the deep fried doughnuts.. I will be making them shortly!! !Tell your son, he started a chain reaction now!!! Sumptuously made. The nice pics make me want it even to the extent of eating it virtually (lol). I wonder if the ingredients are toxic-free and preservative-free. Such a great recipe. I am going to make this for my babies. Can I use parchment paper? Oh yum! I might just have to try the pumpkin version, today. Wow! These look great and not too horrible for you. I’m going to make the pumpkin version. I’ll bet my Boo will eat those. I can see why he wanted them. Not only are they appealing to eat, but they have all the good stuff in them too. I would love to try these w/ a choco glaze maybe. Oh dear heaven. Have I told you lately that I love you? On the weekend’s docket for sure…. Clever boy to find that tempting photo! And nifty mom for making them. I like bananas too- think I will stick with that rather than pumpkin. They are really cute…glad they tasted great too! I just made something similar, baked apple donuts. Diced apples and more like donut holes. Pretty good, will probably do them again as well. What I like about these doughnuts is that they are not your ordinary doughnut. Also, the recipe has been tried and tested. They do look delicious. Thanks for this one. Those look wicked good, I want some for breakfast right now! I know a certain 18-year-old boy who would love these;) Thanks! OK–you’ve inspired me! I have 2 ripe bananas as well–think I’ll try them now (but w/out nuts b/c of allergies)! Yummy! I’ve been craving something just like this. These look really good! I love that they are baked and can’t wait to try them with my daughter! Baked doughnuts sound great! I would probably eat them all before they were even cool. I WILL be making these beauties soon. I have two bananas that are nearly over ripe. My kids will be thrilled! Thanks for the afternoon snack recipes Cathy – keep them coming. Wow..banana donuts! What a great idea. I’ve never heard of banana donuts…I always have extra bananas around…. Portable banana bread in a circle. Genius. Warm banana bread slathered with butter,ooooh. I love the twist here. The things we will try for our kids! But it can be fun to try something new, especially when it works out this well. I am totally drooling! I must make these! These are awesome! I never knew you could bake doughnuts! 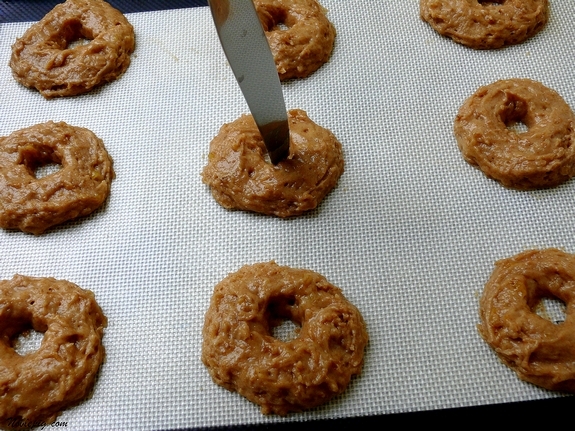 I made baked pumpkin donuts once, but these look so much better! And to think I almost threw out my bananas I had in the freezer – shame on me! What a great idea! I would love to try this with apples too! Holy Wow! Off to check the status of my bananas… please be ripe… please be ripe! I still get requests for the peanutbutter banana muffins! I was just thinking about Baked Banana Doughnuts and youâ€™ve really helped out. Thanks! Your banana baked doughnuts look wonderful! OK, I did it myself, it took me about 2 hours with everything (including washing all after cook) but the taste was excellent. I had some friends over my house and all like it. Those almost look healthy, sounds good! I love your cooking ideas a lot. Great stuff to do for your kids. I know mine love it. I live in Australia and I don’t believe we have pumpkin pie spice. I was wondering if anyone could tell me what was in the spice mix so I could just make it myself? I love the look of these and have 2 ripe bananas sitting on my counter too!! Thanks for a great recipe! I added an extra banana, forgot use the egg whites (just used the whole thing), and didn’t have any wheat flour so I just used all purpose. They didn’t turn out doughnut-y or like the pictures but my boyfriend and his best friend ate half of them (I must have made at least 40) while they were hanging out. Even though I screwed up the recipe the boys loved them so I’m betting these would be great done correctly. Thank you!! Oh I am craving for doughnuts! especially cinnamon, but oh banana sounds so homey and is a great combination with honey! 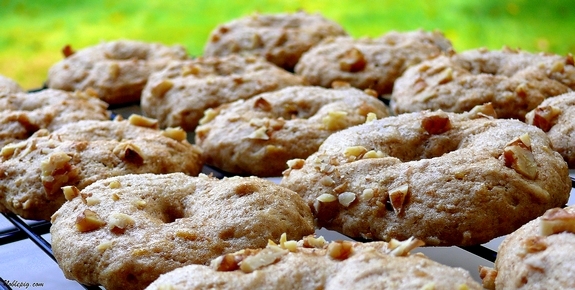 Great recipe to do at home on a rainy afternoon..
What kind of baking sheet do you use? Never seen one like in the photo? That is a silpat on top of my baking sheet.